Most small businesses file their business income tax return on Schedule C as part of their personal tax return. If this is you, you are running out of time. Your personal and business taxes are due on April 15. This article details some decisions you will need to make and what to do to complete your Schedule C by the April 15 deadline. Invest in tax software. To start working on your return on your own, consider downloading tax software for your business type. Check that the software version you are considering purchasing and downloading includes Schedule C.
If you have already purchased software that did not include Schedule C, you could download the document and the instructions for Schedule C from the IRS. Or you may have to upgrade to the version that includes business software. You must submit both your Schedule C and your 1040 together to the IRS. Check on the most recent tax laws to make sure you understand—and take advantage of—any tax changes. The Tax Cuts and Jobs Act has several benefits to small businesses that can save on taxes, and it also has some reductions to deductions and credits. Lower business and personal tax rates and a new tax cut of 20 percent on business income in addition to normal business tax deductions. Entertainment expenses as business tax expenses have been eliminated, and some tax credits are no longer available. Understanding the effects of this tax law change can help you pay the lowest tax rate. Some very small businesses may be able to use Schedule C-EZ to file business taxes instead of Schedule C. Schedule C-EZ is a simple one-page form that asks a couple of questions about your income and expenses. Start working your way through the program. You might go through once with the information you have and take notes on the information that you need. Then, go back again and plug in the additional information. These tax software programs are an excellent way to do a tax return because they ask you questions about items you might have forgotten. Make sure you have taken all allowable deductions and credits. Check for errors before you file. If you make a computation mistake, the IRS will catch it and make the change, but other common errors, such as forgetting to sign the return, will cause your return to be rejected. All business owners must also complete Schedule SE to calculate the amount of self-employment taxes (for Social Security and Medicare). Schedule SE must be completed even if your business had no profit for the year. It is a relatively complicated form, but if you are using tax software that includes Schedule C, it should also include Schedule SE. Read more about how to complete Schedule SE. Check to make sure you have added the Schedule C and Schedule SE information correctly on your personal tax return. Determine how you will send your return. You can send a paper copy, E-File yourself, or you can let your tax preparer or tax software service E-File for you. In any case, make sure your return is sent on time. As a last resort, you might want to consider filing an application for an extension. 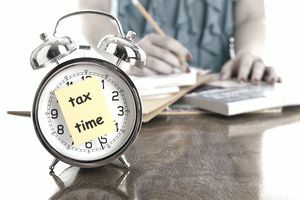 You will still have to compute the estimated taxes and pay before April 18, but an extension will give you time to do a thorough job of preparing your return.